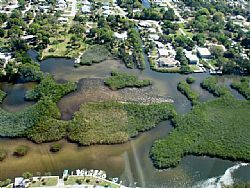 The Sarasota Bay Estuary Program (SBEP) and Mote Marine Laboratory are conducting a series of workshops to identify key elements of a science-based management program that would support research, monitoring and restoration of local tidal creeks. The results will help local resource managers evaluate ways to enhance and restore the tidal creeks leading into the Bay. The effort also supports local water quality objectives. The first workshop was held in June and focused on tidal creek geography and geology. The second workshop on August 19 discussed creek hydrology, or how water moves into and through these systems. The next workshop on September 16 will focus on water quality and primary producers such as phytoplankton, algae and seagrass. A workshop on October 14 will address fish, wildlife and ecosystem processes. A final meeting on November 4 will integrate the information into a report that can be used by local resource managers. Dr. Ernie Estevez, director of Mote's Center for Coastal Ecology, explained that tidal creeks are among the nation's most common coastal landscape feature and they are vital for fisheries. They are also under a lot of pressure from urban development. "Learning more about how tidal creeks function will enable us to apply science-based methods to protect them for the benefit of future generations," he said. The workshops are being presented to SBEP's Technical Advisory Committee (TAC), a 23-member group representing Sarasota County, Manatee County, Southwest Florida Water Management District, Florida Fish and Wildlife Research Institute, Town of Longboat Key, and many other organizations from government and private industry. The TAC initiates technical studies, assists SBEP with restoration and management plans for Sarasota Bay, and reviews various projects.